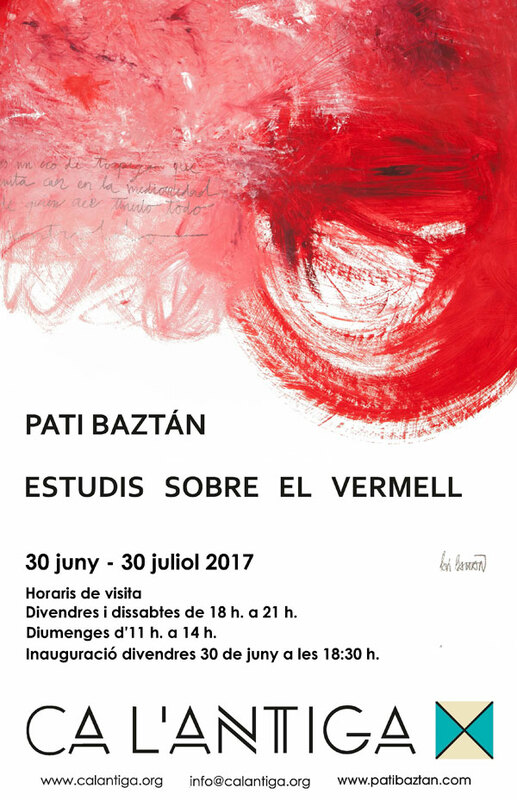 Summertime is a good moment to propose to you an exhibition of paintings by Pati Baztán, an artist that avoids easy and quick paths. Pati prefers to deepen on fundamental aspects of plastic art one by one: for instance, the colour. After years devoted to work on the light of black colour as counterpoint to the, always present, white of the canvas, she presents an exhibition showing her work on RED. The gesture adds to the colour. The gesture in painting expresses the hand of an artist, the character, maybe the energy and, also in the case of Pati, the incredible care in doing her work. You will not suffer from summer warm temperature; on the contrary you will go deep in the meaning of material/colour, into a quiet and fresh conversation on the effect of the artist vision and work on the white canvas. “Estudis sobre el vermell” (Research on red) is an abstraction work with red colour as protagonist. It is a challenge to work with a colour that is powerful but which energy slows down quickly and loses its own light. The idea creating these 10 oil paintings on wood was to neutralize the red keeping the full natural power thus by introducing a balanced dialogue between the emptiness and the side painted. The colour emerge from the work as it has been always there waiting the right moment to finally exist.